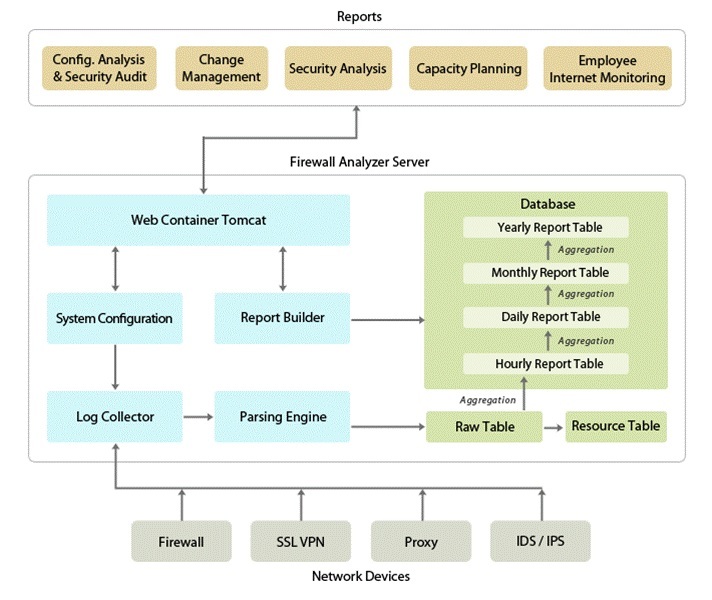 Firewall Analyzer uses a built-in syslog server to store the firewall logs, and provides comprehensive reports on firewall traffic, security breaches, and more. This helps network administrators to arrive at decisions on bandwidth management, network security, monitor web site visits, audit traffic, and ensure appropriate usage of networks by employees. The collected logs are parsed and stored in the inbuilt PostgreSQL database for analysis and report generation. Firewall Analyzer - Distributed Edition is a distributed setup of Firewall Analyzers. The achitecture consists of one Admin server and N number of Collector servers. The Collector servers are installed at different geographical locations (one per LAN environment) and connected to the Admin server. This allows the network administrators to access the details of the Firewalls at different remote locations in a central place. All the reports, alerts and other Firewall information can be accessed through one single console. The administrator of large enterprises with various branch locations through out the globe stand benefited with this architecture. For Managed Security Service Providers (MSSP) it is a boon. They can monitor the Collector server installed at different customer places from one point.